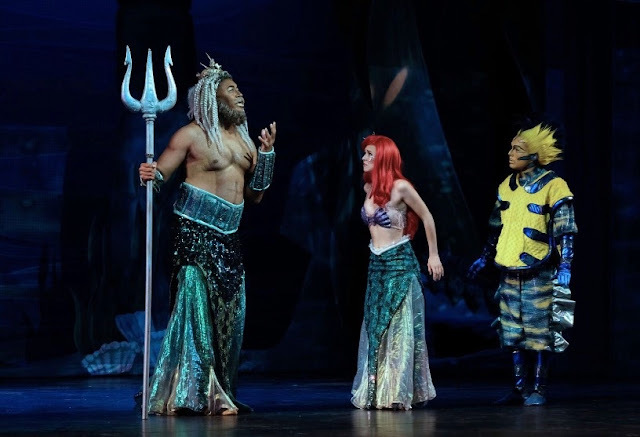 Disney’s “The Little Mermaid” now on stage at Moonlight’s outdoor venue in Vista through Aug. 5th has something for everyone. Moonlight is celebrating its 37th season and it's been a great one so far. For the little princesses in the audiences their heroine is Ariel the mermaid that wants to be a person, live on land and have a pair of legs. Chassey Bennett plays Ariel with childhood innocence and charm. “The World Above” and “Part of Your World”. Her best friend is Flounder (Connor Marsh) the anxiety ridden and adventurous fish that is at her side through thick and thin. Marsh is perfect as her ahem, flighty but loyal to a fault protector. The friendship goes both ways. For those more sinister, the spiteful and evil sea witch aunt Ursula is played with willful glee by Randall Hickman (a stroke of genius by director Steve Glaudini). He brings the house down with “Daddy’s Little Angel” and “Poor Unfortunate Souls”. Some panache that one has strutting around in her glittery octopus gown, with tentacles spreading over the edges of the stage and held by her two pals, Flotsam and Jetsam (Sarah Errington and Rae Henderson) the electric-eel minions. Hickman owns the stage every time he ‘floats’ on. Hats off to superwoman Renetta Lloyd for building that spectacular costume. For those fun lovin’ Seagull watchers Luke Harvey Jacobs’ Scuttle is the perfect bird leading his entourage in one of the shows highlight, showstopper tap dance numbers “Positoovity”! It’s positoovity delicious. Credit Karl Warden for the snappy choreography and Leon Dobkowski for costume designs. Carlotta Malone, Roslyn Lehman and Renetta Lloyd are the dynamic trio coordinating those costumes. J. Branson’s eye catching underwater set and Dobkowski’s costumes are from the Music Theatre of Wichita. I was especially taken with the umbrella jellyfish and hand held sting ray. So much imagination! For those looking for their ‘knight in shining armor’, David Burnham (“Light in The Piazza”) is the handsome Prince Eric on the lookout for a voice (“Follow that voice to the ends of the earth if we have to”) he heard from the ocean only to find his true love voiceless. His voice is awesome. “One Step Closer”, “Her Voice”. 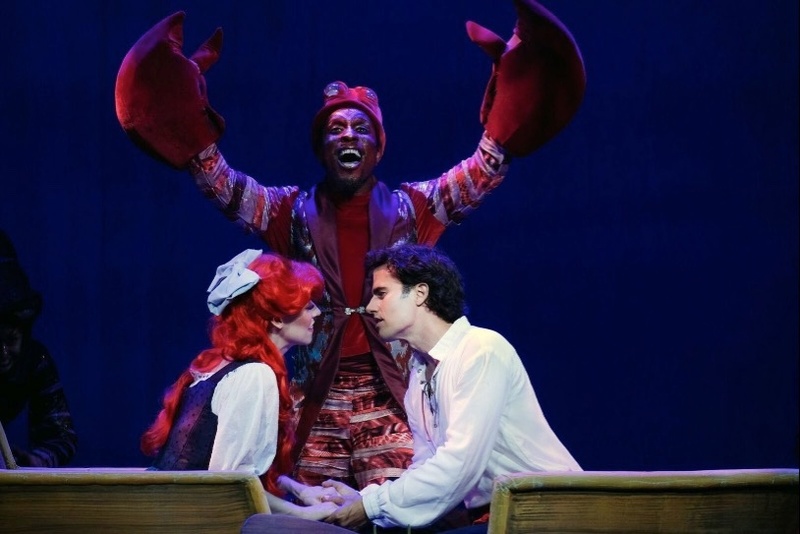 For some comic relief Cornelius Jones, Jr., is the musical mastermind calypso singing crab, Sebastian. His job is to keep his eyes on Ariel, the slippery little independent mermaid who is the star mermaid of her father’s eye, lest she leaves the watery edge to become landlocked. 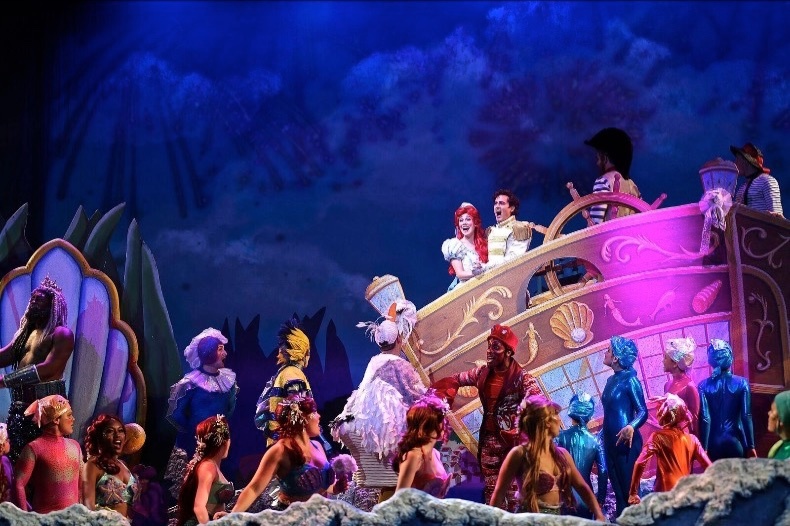 King Triton (a powerful performance by Paul Oakley Stoval) Ariel’s father has six other daughters, The Mersisters. Each one is jealous of their younger sister whose beautiful voice ‘daddy’s little girl’. "If Only (Tritin's Lament)". Stoval's strong baritone voice is simply beautuful. “The Little Mermaid”, a Disney Production, with music by Alan Menken, lyrics by Howard Ashman and Glenn Slater and book by Doug Wright is the second of Moonlight’s ambitious productions of this summer season. It is based on Hans Christian Andersen’s 1837 fairy tale of the same name. If you count them, the huge cast boasts eighteen with some in speaking roles and some in the large ensemble and the children’s ensemble boasts sixteen. All are in sync and all are engaged and eager. Every one of them makes a difference in this production. Musical director and conductor Elan McMahn’s orchestra, always at the top of her game, continues to helm a full sounding Menkin score. Ashman and Slater’s lyrics oft times went over my head a bit. And the ones I did get were clever with a twist or a turn on a phrase bringing it back to the ocean life. 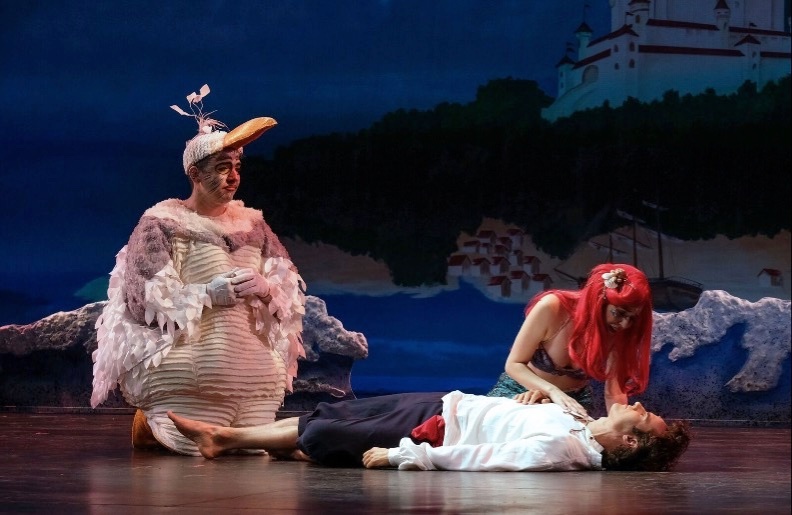 “The Little Mermaid” is highly polished production that defines Glaudidni's talent as a director. The show pretty much follows the movie version that yours truly saw eons ago when grandsons, now 26 and 25 were quite young. The story of a mermaid who dreams of a world above the sea and is willing to give up her voice to find true love and a prince who would rather go sailing with his buddies than rule a kingdom has a feel good ending when all is said and done. I suppose it would be golly -gosh to say they all lived happily ever after, but I will anyway. Even with its updated, songs and a few tweaks, it still plays out well for the young at heart. As a side note, Glaudini's choice of Hickman (who played Edna Turnbald in “Hairspray”) elevated a child’s Disney fantasy film into a bustling and rousing stage production intended for the entire family. Enjoy!